'Ard Boyz begins next week with the first qualifying round on Saturday, May 15th. I won't be attending due to another commitment. However, if I was going to be playing with my Ork army, I think the list below would give me the best possible chance to win with it. Typically 'Ard Boyz is about target saturation. Most units in that format have a good chance of survival on a unit per unit basis. But if you have enough units you can overwhelm your opponent on your turn and then clean up the remains. Quality units tend to fall by the wayside in a format like this. The cheaper the units the better. This list offers decent shooting while not featuring Lootas. They are absent for several reasons: 1)Maxed Loota squads are extremely expensive, even in a large point environment 2) They are difficult to deploy in large numbers and 3) They cannibalize nob slots. In lieu of lootas I offer long range shooting in the form of 9 kannons and 9 buggies. Not quite as shooty but a serviceable and less expensive alternative that doesn't clog the elite slot. That probably isn't sufficient if you go second against another army with long range shooting, but should be adequate if you get first turn. Aside from our shooting we use warbosses to unlock additional nob slots in the troop force org and saturate the board with cheap, if otherwise flimsy troop units. The idea is to get as many powerklaws as possible into your opponents lines before they have a chance to kill all your trukks. With the shooting support neutralizing your opponent's shooting as the trukks close the gap this is theoretically feasible. 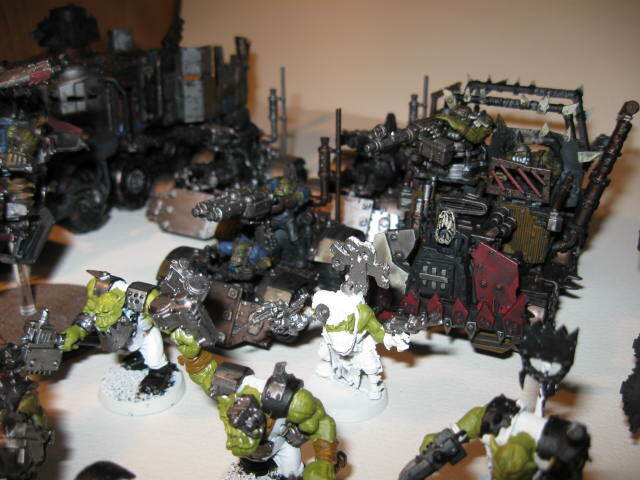 'Ard Boyz is a competitive tournament and I'm not sure if Orks are the best army to play in that environment. However, if I was to play Orks, I'd play the list above because I think for that army it offers the best chance to win. 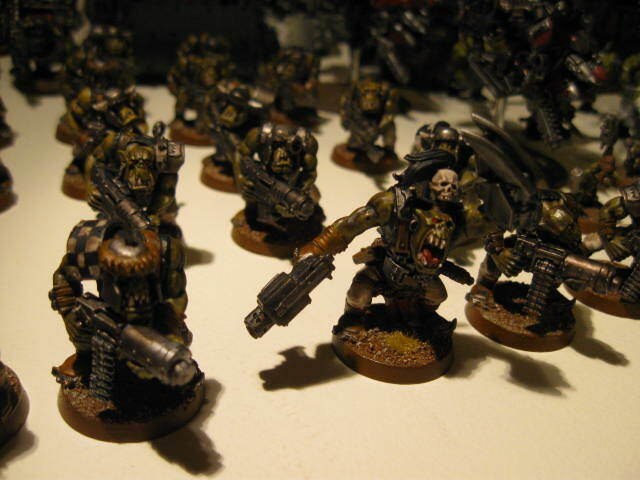 3 Response to "Army: Orks for 'Ard Boyz"
What makes you favour Nobz over Meganobz in this list, given the theme is "getting as many PKs as possible into your opponents lines"? Is it the lack of an invulnerable and bosspole? If I added it up correctly, the nob squads go for 225 each, which would let you get 5 MANz /w some limited diversification. I think you can make a good case for Meganobz and I wouldn't discount them outright as a choice for the elite slot. However generic nobz are ironically more resilient against death star units that carve through armor value 2 and at this point level Meganobz lose a lot of their luster because there is so much AP 2 spam. Without an invulnerable save MAN can become lascannon or plasma fodder. At least the generic nobz get a 5+ save. Also generic nob units benefit from wound diversification where as you admit your MAN are more limited beyond a unit of 3.